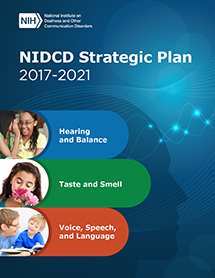 The NIDCD recognizes the importance of research training and career development opportunities to prepare a talented and diverse biomedical research workforce focused on communication disorders. The NIDCD supports fellowship, career development, and mentorship opportunities at universities and institutions nationwide (extramural training) as well as at the NIDCD laboratories and clinics in Bethesda, Maryland (intramural training). International research training opportunities are also available. Learn about the NIDCD’s long-standing commitment to research training and career development to ensure a productive, innovative, and diverse scientific workforce within the NIDCD’s mission areas. Find out whom to contact for more information on our extramural and intramural training programs. Learn about the types of research training and career development awards that the NIDCD supports, such as fellowships, institutional awards, and career development awards. Includes links to funding announcements. Find NIDCD-supported institutions that offer research training opportunities at the predoctoral or postdoctoral level. Find helpful information and guidance on the grant application, review, and award process. Learn about about research training opportunities in the NIDCD intramural research training program, NIDCD training events, and NIH research training resources, including loan repayment programs.